Rattled by the saffron surge in Gujarat, the Opposition parties tonight presented a picture of unity on the eve of the Budget session of Parliament by deciding to bring an adjournment motion on the Ayodhya issue as part of its plans to pin down the BJP-led government. Should women be allowed to do seva at the Golden Temple? 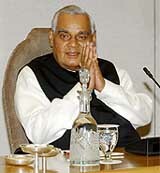 In a conciliatory tone, Prime Minister Atal Behari Vajpayee tonight said his government was prepared to discuss all issues, including Ayodhya, in Parliament during the Budget session commencing tomorrow and sought constructive cooperation from the Opposition but the ruling NDA was also prepared to face the Opposition onslaught. 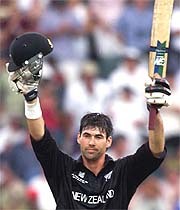 New Zealand captain Stephen Fleming celebrates his century as Kiwis upset South Africa in the World Cup match at the Wanderes in Johannesburg on Sunday. Adopting a tough stand on the issue of illegal Bangladeshi immigrants, India said today that these “foreigners” had to be deported “firmly but lawfully”. The controversy over allowing baptised Sikh women to allow any ‘seva’ inside sanctum sanctorum of the Golden Temple took another turn when Mr Raghbir Singh, personal assistant to the SGPC, Chief Bhai K.S. Badungar, who was manager of the Golden Temple at that time, claimed that the Sikh clergy had not issued any directive in this regard on February 9, 1996. Demanding the arrest of Congress leaders allegedly responsible for the 1984 anti-Sikh riots, a group of riot widows today postponed their self-immolation plan on the Centre’s assurance that the Nanawati Commission would submit its report by March 31, 2003, and their demands would be “sympathetically” considered. Electioneering din touched its peak as traditional political rivals — the BJP and the Congress — ended their first round of “carpet bombing”, by taking their political agenda to the voters at the grassroots level. 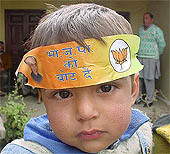 This child seeks votes for the BJP at a party function in the Mewa Assembly segment of Hamirpur district on Sunday.